For example, we expect the S&P to work it's way up to 1,600 and that's SPY $160 and the Jan (2013) $146/154 bull call spread is $3 and you can sell the $110 puts for $3.15 so a .15 credit on the $8 spread and all we need is that 1,550 that everyone is predicting to make 5,433% on cash. TOS says the margin on the short $110 puts is net $11 so a very nice return on cash too – if it works. As we can stop out the spread at $2, it's worth our while as long as we don't believe the S&P will fail 1,100 this year. XLF should also fly if we make it through this quarter without slipping into another financial crisis. The Jan $13/16 bull call spread is $2 and you make 50% in 10 months on that just by getting it right. You can also sell JPM Jan $30 puts for $1 to knock the net down to $1 and making it a 200% potential upside or sell the JPM 2014 $28 puts for $2.10 and get a net .10 credit and a 3,100% upside potential gain on cash. I can only tell you what the market is likely to do and how to profit from it – the rest is up to you! The suggested 10 contracts at that time were a net credit of $100 and returned $3,000 per set and our worst-case scenario was owing JPM for net $27.90 (now $55.60). This is exactly the type of "boring" trading style we were discussing in yesterday's webinar as we build our new Buy List. While we wait for the correction, we shorted the Index Futures again in our Live Member Chat Room this morning at Dow 16,700 (/YM), S&P 1,920 (/ES), Nasdaq 3,725 (/NQ) and Russell 1,120 (/TF) because we're not anticipating good data today (/NKD 15,000 is also a good short when it breaks and, of course, we shorted oil at $103.50 (/CL)). We'll take the money and run ahead of the Beige Book (2pm) but I'm pretty sure that will not show the improvement that is expected – now that the weather is no longer an excuse. Nonetheless, I'd rather wait and see than make any big bets on the outcome. This entry was posted on Wednesday, June 4th, 2014 at 8:29 am and is filed under Appears on main page, Immediately available to public, Uncategorized. You can leave a response, or trackback from your own site. Good morning-very quiet here. Nice sunny day up North @ 50 degrees! If your computer is slower than usual that blast of hacking or whatever it was had an effect. Clean out cookies and defragment. Made a big difference on mine. Yes, the maintenance that I try to do at night. Good morning! I've been using Norton 360. Its PC Tuneup feature can optimize your PC performance when it's in idle mode automatically. Phil – Remember this guy from last week ? DragonWave raises Q1 revenue guidance to growth of ~60% QoQ, which equates to ~$28.6 mln vs $26.9 mln Capital IQ Consensus Est, up from growth of 50% QoQ, which equates to ~$26 mln. Economic numbers not that great today – PMI numbers in Europe pretty much below expectations everywhere except in the UK. France still contracting. Australia GDP better than expected but that doesn't move the needle much. Europe GDP meeting reduced expectations and PPI seem to point toward deflation. ADP numbers not meeting expectations in the US either. Still to come ISM and then Beige Book. I guess we'll go up then! Transportation stocks have been rising steadily, along with everything else. The broad strength and duration in that sector from airlines, railroads, rental cars, shippers suggests an economy on the move, not a -3.6% GDP drop Q/Q. Leaves me a little bewildered. What do you think is going on? Futures a little bouncy but I'm sticking with my downside lines (see main post) until they break (3 of 4) to the upside. Just feels like we should get a move down today. Stock futures indicate modest losses at the open after private-sector job creation fell short of expectations in logging the slimmest gains in four months; S&P and Dow -0.2%, Nasdaq -0.3%. The Fed’s Beige Book survey of regional economic conditions is due at 2 p.m., but the impact likely will be limited as investors focus on nonfarm payrolls due tomorrow. Markets are lower across Europe with weakness most apparent in the periphery; markets closed lower across most of Asia. Treasurys trade at session highs, with the benchmark 10-year yield down more than 2 bps at 2.570%. Still ahead: PMI services, ISM non-manufacturing, EIA petroleum inventories. Dow -0.12% to 16,701.50. S&P -0.20% to 1,920.40. Nasdaq -0.38% to 4,222.23. Treasurys: 30-year +0.07%. 10-yr +0.06%. 5-yr +0.03%. Commodities: Crude +0.68% to $103.36. Gold +0.2% to $1,247.00. Currencies: Euro -0.07% vs. dollar. Yen +0.08%. Pound -0.02%. May ADP Jobs Report: +179K vs. +210K consensus, 215K (revised) prior. Q1 Productivity and Costs: -3.2% vs. -2.9% expected, -1.7% prior . Unit labor costs +5.7% vs. +5.2% expected. The 10-year Treasury yield dips two basis points to 2.58% following a small miss in ADP jobs, with a gain of 179K vs. 210K expected. April's gain of 220K was revised lower by 5K. Composite Index: -3.1% vs. -1.2% last week. Purchase Index: -3.6% vs. -1.1% last week. Refinance Index: -2.9% vs. -1.4% last week. Fixed 30-year mortgage rates 4.26% vs. 4.31% last week. Apr. Trade Balance: -$47.2B vs. -$41B expected and -$44.2B (revised) prior. U.K. rate hike nearer after strong PMI? Sterling (FXB) cuts its losses following the strong print, now down 0.1% and buying $1.6732. The FTSE, however, isn't as big of a fan of the economic news, quickly shedding 0.3% after the report. "It's still too early to break out the champagne," says AMP Capital's Shane Oliver after Australia's Q1 GDP rose 1.1% Q/Q and 3.5% Y/Y, both beating forecasts and coming in at the quickest pace in two years. "Growth will not be sustained at this pace for the next few quarters." The slowdown in Oz over the past couple of years has come about thanks to a downturn in the mining industry as demand from Asia (China) slows, and the central bank has slashed interest rates to a record-low 2.5% in response. "FIve minutes of economic sunlight," is how Deutsche chief economist Adam Boyton describes the GDP report, expecting the mining investment slowdown to continue to be a drag. The aussie is up 0.1% to $0.9273 and stocks in Sydney closed lower by 0.6%. "Underperformance has left CS shares with 35% upside potential to our target price, one of the highest in the sector," says analyst Jernej Omahen, upgrading the stock to a Buy and adding the name to Goldman's Conviction List. "Our analysis underlines that Credit Suisse's business mix embeds strategic optionality for group ROE expansion that other, non-Swiss, investment banks don’t have." The bank's "reorientation" towards private banking and wealth management could: 1) Improve returns; 2) Improve capital generation; 3) Reduce TBTF risk; 4) Close the valuation gap with UBS, which currently trades at a 51% premium based on 2104 earnings estimates, and a 42% premium based on 2015 price/tangible book value. Goldman also pulls its Sell rating on Deutsche Bank (DB) citing the recent capital raises (the latest one is today) and the bank's new strategic direction. Deutsche Bank (DB) will price its €8B ($11B) capital hike today at between €21 and €21.50 per share, reports CNBC, a sizable discount to the current price above €29. Nevertheless, the stock is higher by 0.8% in Frankfurt action as the discount was likely expected and priced in. The bank is tapping shareholders for €6.3B of the new equity and is getting another €1.75B from Paramount Holdings Services, an investment vehicle controlled by the Qatari royal family. Hovnanian (HOV): FQ2 EPS of -$0.05 misses by $0.08. Revenue of $449.9M (+6.4% Y/Y) misses by $26.8M. The Department of Commerce has imposed new preliminary tariffs on Chinese solar module imports, covering both modules featuring Chinese and non-Chinese cells. Trina (TSL) is seeing an 18.56% tariff, bankrupt Suntech (STP) a 35.21% tariff, and most other firms a 26.89% tariff. The move follows a complaint from Germany's SolarWorld that Chinese firms are using a loophole involving imported cells to sidestep the DOJ's 2012 tariffs. A separate anti-dumping decision is due on July 25. Morgan Stanley notes many were expecting either a lower tariff (perhaps around 15%) or a settlement similar to the EU/China deal. Not surprisingly, the Chinese government says it's "strongly dissatisfied" with the DOC's action, and warns it could hurt trade ties. Chinese solar exporters are off: TSL -6.2%. YGE -5.8%. CSIQ -5.1%. JKS -8.8%. JASO -4.4%.CSUN -3.3%. U.S. peers First Solar (FSLR +2.5%) and SunPower (SPWR +5.5%) are higher. But SolarCity (SCTY -2.8%) and SunEdison (SUNE -3.5%) are off, as investors fear higher panel costs for solar projects. Also: SunEdison has announced a new $500M convertible debt offering. $350M-$400M of the proceeds will go to its TerraForm Power (TERP) spinoff. FuelCell Energy (FCEL) -12.8% premarket after FQ2 earnings and revenues fell short of estimates, with losses widening as expenses rose. Though FCEL has been stuck in the red, revenue generally has increased as cheap natural gas drove down power production costs and demand rose, but overall revenue fell 10% to $38.3M in FQ2; product sales fell to $27.7M from $34.4M a year earlier, while service agreements and license revenue totaled $7.2M from $4.1M. Gross margin fell to 4.2% from 5.5%, as product sales mostly were fuel cell kits and modules compared with higher margin complete power plant revenue in the year-ago period from the Bridgeport fuel cell park project. Backlog totaled $342.8M at the end of FQ2 vs. $326.9M at the end of the previous quarter. Issues in-line guidance for Q3, seeing revenues of $50M-$60M vs. $53M analyst consensus estimate. Also: PLUG -5%, BLDP -3.3% premarket. Following the merger of Holcim and Lafarge (HCLMF, HCMLY), the two companies are divesting certain cement and building-aggregate plants, and both KKR and CVC Capital partners have met with bankers to talk about a deal, according to Bloomberg. The two could go it alone or form a larger consortium, according to the report, which notes talks are only in preliminary stages at this point. Major automakers in Europe are using a heavy dose of incentives to push up car sales. Barclays estimates averages discounts at Peugeot (PEUGY) and Citroen were at 24%, while Opel (GM) was even higher at 25%. Government subsidy programs in Spain and Germany are also artificially boosting demand in those markets. The concern of industry watchers is that excessive production capacity could be revealed if incentives and subsidies are peeled away in key markets. Sands China (LVS) took down 23% of the gaming revenue in Macau in May, according to a Portuguese newspaper. SJM Holdings (SJMHF) and Galaxy Entertainment (GXYEF) trailed Sands by just a bit. Wynn Macau (WYNN) and MGM Resorts (MGM) lost a little market share during the month. A drop to single-digit growth for the overall Macau gambling market rattled the sector yesterday. Canaccord Genuity warns that buying shares of Nike (NKE) in anticipation of a World Cup rally is a risky proposition. Over the last six World Cups, Nike has typically peaked in the months ahead of the global event before settling back during the tournament. Volatility in Nike trading during the soccer-frenzied months has also been sky-high. Analyst Camilo Lyon recommends investors look for a buying opportunity well-after the FIFA World Cup Trophy has been lifted. MoffettNathanson warns on rising content costs at AMC Networks (AMCX). Analyst Michael Nathanson calls out the $43M increase in national network programming expenses as a sign that margins could get pressured later this year. The investment firm downgrades AMCX to a Neutral rating from Buy and trims its price target to $67. Wow, 16,650 – that should be bouncy so don't be greedy! Can always re-enter if it breaks. Are Stocks Expensive? The 2 Perspectives. DRWI/Albo – Very nice, good call! Don't forget to take a little profit off the table. PMI/StJ – And don't forget that PMI is forward-looking sentiment, not facts. It shows reality is finally hitting the top 10% Purchasing Managers, who are no longer thinking things will get better in the 2nd half of the year (the prevailing opinion that has driven things so far). Transportation/Sibe – See StJ's charts from this morning. The top 10% are doing well, that's 30M people in the US and 700M people in the World who have money to spend. Planes fly 1.8M people per day so, if all 700M people who have money made one trip a year, that's 1.4Bn flights or 3.8M per day – enough to fill every plane in the world twice over. Oil is shipping by rail as are cars and nat gas and ships are being used to store oil, nat gas and other unsold commodities (Chinese are hiding their copper surplus) – so a lot of distortion in Transports is making them a less reliable indicator than they used to be. Keep in mind that 70% of our GDP is Consumer Spending and 20% is Government spending so they can talk about coal and materials and trade numbers all day long but it don't mean a thing unless people are ultimately buying things. HOV/Pwright – Too bad, I was hoping for a nice entry. ISM strong at 56.3 vs 56 expected and we're bouncing back to our shorting lines! DO NOT CONFUSE THIS NATIONAL REPORT with the various regional purchasing reports released across the country. The national report's information reflects the entire United States, while the regional reports contain primarily regional data from their local vicinities. Also, the information in the regional reports is not used in calculating the results of the national report. The information compiled in this report is for the month of May 2014. These are good numbers – I wouldn't re-short now. May US PMI Services Index: 58.1 vs consensus of 58.4, 55 in April. Barry's new article on bearish gold. He probably not a value investor, but a technical trader…. PPG/Phil – just tapped new highs. cool new products too (a marine silicone-based anti-fouling for one). your thoughts? good defensive in this market? I don't know what Barry is these days (since selling out to Bloomberg)! 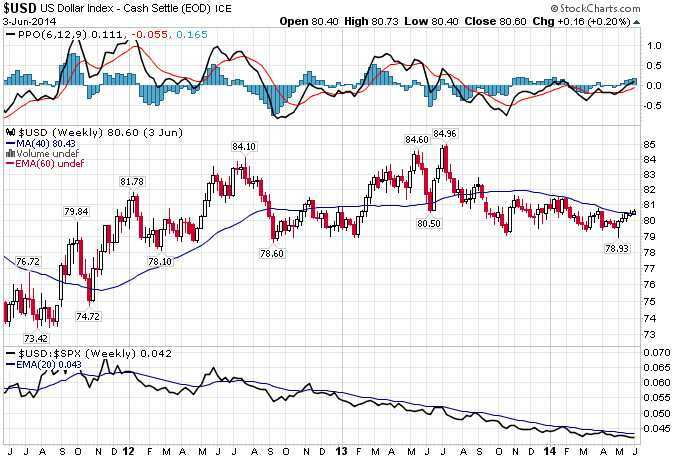 Gold vs. stocks is being used to prove there's something wrong with gold? Perhaps there's something wrong with stocks? The driving force in the technical weakness of gold has been the rally in the U.S. dollar, which Parets describes as potentially an “epic squeeze.” Historically, there has been a reliable negative correlation between precious metals and the dollar. Citing "low inflation" as a reason gold is "finished"? Really??? I'm sure 1) Economic Stability, 4) Geopolitics and 5) No equity crash are things we can count on to last forever? As I said yesterday in the Webinar (and the post) $1,250 is about what it costs to make gold – a flood of inventory onto the market (from people dumping the ETFs) can drop the price below cost for a while but then – it comes back. Oil inventories down 3.4Mb, much better than API report. Gasoline up 100K is TERRIBLE around the holiday weekend (we never did get a big draw). Not supportive of $104 but first we'll see if they can hold $103.50 (doubt it). Short below that line with tight stops on /CL. lol I guess Bloomberg is Barry's new boss. PPG/Scott – A $200 stock at the all-time high and up over 100% in 2 years and NOW you want to enter it? To some extent, you're betting on a broad economic comeback but their big pop in revenues last year came from profits selling off a division ($2.2Bn out of $3.2Bn total) and that's not happening again this year. I'm not sure what the net effect of losing the Commodity Chemicals Business will have on them – analysts don't seem to think it will have much impact and the stock is up another 10% this year but it's not compelling enough for me to want to play with. At least prices are flying! What inflation? Great drop on oil to $103.25. Hopefully more to come. In an article in the May 26 edition ofThe Week — “What conservatives don’t understand about the modern U.S. economy” — James Pethokoukis of the American Enterprise Institute has issued an economic challenge to the right from the right. Pethokoukis’s piece is an assault on the economic manifesto that was put out on May 16 by a conservative group that included three icons of the right: Ted Cruz and Mike Lee, senators from Texas and Utah, respectively, and Ed Meese, who served as attorney general under Ronald Reagan. i apologize if someone posted this already — coupled with an aggressive move down in tlt and an attempt to break lower channel support over the past three days i found this very interesting. Phil – I'm trying to catch up with all the reading I missed. I see you posted lists of trade ideas. Can you tell me in a quick post, which ones you entered into the portfolios? I'm assuming the rest are "on watch". Just the stock name is fine, I'll find the trade. This is post LTP cash out I'm taking about. Nice to have caught that drop in oil at 10:40 or so but man you had to be quick to get out before it was back over 103.30. Still good for a couple hundred in just 15minutes of work! Definitely takes care of my gambling urges and reminds me why I gave up the casinos way back when my disposable income suddenly had to be disposed of to take care of a family. Here a sleeper for you and from that I ask you to just contribute 50$ to the shadowfax fund.!!!! Here you can have it both ways! Your total investment in this is 9,672.00 and by selling still &frac12; monthly 3x off callers 13 x @ .35 to .40 gives you an other 1520.00 Remember you as well you will collect 6x .64 div. Did I say this play cost you any money??? Question is this not worth 50$ ???????????????????? We are having a special Webinar tomorrow at 7pm (link here) but probably not too interesting to you guys as it's the 7 Steps again. HOV and FCX are the trade ideas but mostly it's talking about the general LTP strategy. Oil $103 – Yay! I still want to see $102 or lower but 1/2 out if they retake $103.10 and the rest give up at $103.30 and we move those stops down .25 each time they cross a .25 line. Treasury/Toe – This is why the Fed can't ease forever – at some point, people will stop buying bonds and rates WILL rise. They have chased so many people out of bonds and into stocks that it's hard for them to stop buying bonds themselves – as they are the only buyers left. This can lead to some very distorted issues when it all hits the fan. Thanks MB, we have to keep mentioning it if we want to get to our goal (not even 10% there yet). Trade Ideas/Burr – We only added a couple that I remember and out of 20 on the Buy List and 20 from the LTP, the key is to just wait PATIENTLY for one of the 40 to drop 10-20% and THEN (assuming the fundamentals haven't changed) make an entry. We're waiting until next Tuesday to evaluate anything for the LTP, which just has the 2 short puts (HOV and EGLE) remaining. Oil/Craigs – That's why you have to practice, Practice, PRACTICE – until you are taking those profits in your sleep. You should always have an itchy trigger finger in the Futures – the second you get into a trade, you should be dying to get out! Once you get very good at making a quick $50, $100, $200 – then you can start taking chances – because you know that you can always get it back (which helps you properly decide to give up on losers). Green coin/BDC – Get me a million of them – I'll send you $100. PG/Yodi – Well worth it, thanks. Gasoline (/RB) got slammed on that inventory report – from $2.96 back to $2.935. Oil down to $102.63 and not looking strong here – very bad for them if $102.50 doesn't hold – no real support again until $102. Scott – I feel like "relative timing" is the term. Hindsight is 20/20 sure but buying any time in 2009 and holding on "grim" would've produced 100-200%+. I think the general feeling in PSW now is we are at a relative high. I'm 50% cash, down from 65% two months ago, so rolling out slowly. QUIK – Been covering part of my position by selling some Jan $6 calls. Still mostly uncovered. Ebay – major PayPal hack today… got a call from a friend this morning who's account was hacked, and shortly after that, received a phone call from PayPal with an automated fraud detection notice. Logged in and found two unauthorized transactions made this morning. This morning Diesel dropped $.30 to $3.989 per gallon. I have been saying roads are empty and this shows they just can't sell diesel over $4. I live on the great vacation land entrance to Yellowstone and no one is coming. We are in a recession but no one will admit it until 2 negative quarters. Phil pointed out the new way to measure GDP added 3%. Clearly the last half of last year and this year is contracting and we are outdoing the rest of the world. What a joke! down 50% – DD ?? related – anyone share any light on END ? Even with covered calls I'm getting murdered – anyone ? Yodi; Not following how the total investment now is $9,672? Stock $15,984, 70/80 calls $1,400, short Puts $1,700 credit. Sorry if I am missing something obvious. phil// CLF – trade of the year suggestion – should that also be liquidated? Has your view/fundamentals have changed since the suggestion? Thanks. IF/When bonds do unravel….they WILL take this market with it IMHO. Gold will Fly Like and Eagle…. When I had a Diesel car I had 4 of them I would use heating oil, in the winter add a little gas and every 5,000 miles a little transmission oil to clean the heads. I had a tank in the garage when I had oil heat, never when to a gas station not if that would work today. I have a diesel truck, costs much more than my car to drive so 1 year 1 tank of fuel. Off road fuel has red color on road a little green, big fines, and not much cheaper, gas is still cheaper. Makes no sense as gas takes more crude and refining unless one realizes this is big oil making sure people don't go diesel cars. Also screws all that heat that way so give them a bigger tax break right now, retroactive would be better for them! Paypal/Scott – Yep, because there's nothing smarter than unregulated banking! Joke/Shadow – The problem is most of us, not just in PSW, but the investing World in general are high in the top 10% or top 1% and we simply aren't on the ground with real people. A lot of people think because they employ low-wage people or have family members down there that they know what it's like but they don't and the same goes for reporters, analysts, TV people, etc – they are in the same kind of "bubble" the President is in in relation to the bottom 60% and, for the most part, the bottom 80%. That's why people can't see it. They don't want to and, even when they do want to, they aren't in a place where it can be seen. The act of becoming a politician catapults you into the top 10% on salary alone ($174,000 for Congressmen) but it costs them $20M to get elected – and they can't do that without getting a stamp of approval from people in the top 1% in the first place. So the entire system is skewed and, if people try to fight the system and get elected, the first thing "THEY" do is upgrade that person's lifestyle and put them into the top 10% (plus a ton of perks) and so the corruption begins. Look at Barry Ritholtz – all of a sudden, now that he's working for Bloomberg, inequality isn't a big issue in America and the stock market isn't overvalued. What did it cost Mike ($33Bn) to buy Barry? Even if he gave Ritholtz $10M – that's just 10/33,000 of his cash to purchase an influential journalist and change his tune. We've peaked on consumption – it's not a fluke. Renewables will continue to gain and the rest will fall off over time. It will be slow – like peak wood in 1870 (when we were using it to run steam engines) but there are no more 3rd World Markets to open up, there aren't 5Bn more people to industrialize. DBA/Wombat – DD on what? We've been done with them for a while. I'm not sure what's down 50% but it's not the right time to jump back in. END/Wombat – Yes, I can shed some light on it. It's a ridiculous penny stock which has never made any money and keeps issuing stock and dilluting the shareholders to stay afloat but the CEO takes a $1.8M salary and pays the CFO $500K and another $1.5M to two VPs to keep the plates spinning while they burn through the cash you gave them. CLF/Rookie – It's still in the income portfolio at $9.65/11.32 (called away at $13) on a buy write with 1,000 shares and we'll be fine about doubling down at $6 so I don't see any reason to liquidate it. In the LTP, it's gone and I'm in no rush to buy it at the moment for $14.85 but perhaps we'll sell some puts after earnings. The combined option play runs plus minus to sero. Yes the purchase of the 200 stock will cost you 15984.00 but I have taken a margin requirement of 9,672.00 as the stock is not considered as cash. the stock stands only to cover the 2 additional short jan16 callers and to collect the div. and possible covers the selling of 1x monthly callers, if you decide to do without the stock you will reduce your return as you reduce tow jan16 callers by 2x where the total option play will cost you than about 950.00 instead of sero. Just remember by buying the BCS you alway cap your max return at 10$. As well remember when selling puts you must like the stock.! Is there any trade in the changes coming in Fannie Mae and Freddie Mac? When/Pharm – When is the question. Fannie and Freddie/QC – I have no freakin' idea what is going on with those guys – total crap shoot, not interesting to me. Crude -3.4M barrels vs. -0.3M expected, +1.7M last week. Gasoline +0.2M barrels vs. +0.3M expected, -1.8M last week. Distillates +2M barrels vs. +0.7M expected, -0.2M last week. The loonie (FXC -0.3%) slides about 30 pips to $0.9128 after the Bank of Canada leaves its benchmark policy rate at 1%, but says the recent faster-than-expected rise in inflation to near the 2% target is largely the result of temporary factors like energy prices and pass-through from the weakening currency. "The downside risks to the inflation outlook [is] as important as before." As for global growth: " Recent developments give slightly greater weight to downside risks." Norwegian onshore oil workers break off pay negotiations with employers, increasing the risk of a strike, as the industry fails to achieve full or partial deals in three separate discussions with workers on offshore platforms, supply bases and at oil service companies. The Industry Energy union, which represents more than 75% of 5K onshore workers at companies like Statoil (STO) and BP, ended talks yesterday; negotiations now move to public mediation, where failure may result in a strike. A strike would cut off ~50K bbl/day of oil at Exxon's (XOM) Ringhorne, Jotun and Baler fields, 28K bbl/day of oil and 11M cm/day of gas at GDF Suez’s (GDFZY) Gjoea field, and 22K bbl/day of oil from STO’s Vega field that goes through Gjoea. Penn West Petroleum (PWE +0.7%) should start to reward investors as restructuring efforts gain traction, perhaps as much as 35%, Barron's David Englander writes. PWE has been cutting costs, selling lower returning assets and focusing its spending on its oil plays with the greatest potential; while the actions have yet to yield meaningful results, they could soon show progress, Englander says, and improving cash flow and a stronger balance sheet could send shares higher. A Barclays analyst notes that PWE's cash flow per barrel of oil equivalent has surged 42% in the past year. Diamond Offshore (DO -2.3%) says Statoil (STO -1.9%) has canceled the rental contract for its Ocean Vanguard semi-submersible rig eight months earlier than expected, confirming an earlier report. STO says the termination is due to "technical aspects of the rig," without offering a further explanation; DO says it disputes STO's basis for canceling the contract and will defend its rights under the drilling contract. The rig had been expected to remain on contract for STO until next February at a rate of $454K/day. Now that Newmont Mining (NEM +0.7%) has decided to go it alone after rejecting the potential merger with Barrick Gold, NEM is stuck having to choose between letting production decline or spend money to boost it, Morgan Stanley says. NEM’s volumes could fall by 10%-15% by 2020 if no new projects are added, and current capex is low by historical standards, Stanley says; NEM's 2014 capex/revenue at spot gold of 18% is below the historical average of 23%, so volumes from operating mines could fall to ~4.4M oz. by 2020 vs. 5.1M oz. in 2013, posing a de-rating risk. The firm thinks small competitors in the space are a better bet, noting that recent bidding for Osisko indicates high interest among larger companies for assets in safe jurisdictions. Northrop Grumman (NOC +0.3%) won a five-year contract valued at up to $9.9B from the U.S. Air Force to modernize and support the B-2 stealth bomber, the Pentagon announced late yesterday. The contract calls for B-2 enhancements, software maintenance, and other support services, including scheduled maintenance of the bombers. The Defense Department has expressed a need for 80-100 new bombers, and NOC faces competition from the team of Boeing (BA) and Lockheed Martin (LMT), which last October announced a partnership to compete for the LRS-B program that will replace the B-2. Shares of Tesla Motors (TSLA -1.2%) track lower the day after the company held its Investor Day in California. Analysts think the lack of clarity on plans for the Gigafactory could be behind the dip. Debate on legislation to legalize gambling in Japan could begin as early as next week, according to a Parliament member. Prime Minister Shinzo Abe has been drumming up support for the measure from inside his party and with outside coalitions. Casino companies with big plans in Japan: MGM Resorts (MGM), Caesars Entertainment (CZR), Wynn Resorts (WYNN), Genting, Las Vegas Sands (LVS). Coach (COH -3.8%) trades lower after Sterne Agee takes a dour view on the luxury retailer. The investment firm takes its rating down to Neutral from Buy and drops its price target by $10 to $41 off of concerns the brand has been tarnished. An early check on Q2 sales trends doesn't indicate a large turnaround is in place, notes Sterne Agee. Shares of Coach are down 31% YTD. The special committee investigating Muddy Waters' fraud allegations against NQ Mobile found NQ's cash balances "were verifiable and consistent with public disclosures," and uncovered no evidence its revenues were "inconsistent with public disclosures." The committee also declares NQ's past/present relationships with business partners (inc.Yidatong) "serve legitimate commercial objectives," and that its M&A activity followed due diligence. It did uncover "some lax internal controls and informal business practices" at NQ prior to its May '11 IPO, but doesn't view them as a reflection of fraud. The committee "has made a series of recommendations to further enhance the Company's internal controls," which the board has adopted. Shares have soared for the second time in a week. They jumped last Friday after NQ issued strong guidance, and disclosed an FL Mobile investment that could pave the way for an IPO. A new $10/month "Spotlight" subscription option ($8/month if billed annually) provides access to all of LinkedIn's (LNKD +0.6%) premium features … save for the ability to message members a user isn't connected with. Business plan ($30/month) subs can send 3 messages/month, and Business Plus ($60/month) subs can send 10 messages/month. Along with the cheaper subscription option, LinkedIn is rolling out a slew of new features for premium subs. These include larger search listings (twice the size of free member listings), an "Open Profile" option that allows all members to see a user's full profile, and keyword suggestions for making a profile stand out. LinkedIn is also giving premium subs revamped, image-heavy, profile pages (echoes of Facebook's Timeline pages), but this feature will be rolled out to free subs in a few months. LinkedIn's subscription sales rose 46% Y/Y in Q1, and accounted for 20% of revenue. The update comes with shares down 39% from a high of $257.56, thanks to valuation and growth concerns. In its last monthly audience report (quarterly numbers will still be given), Pandora (P -2.2%) states it had 77M active listeners in May, up from 76M in April and 70.8M a year ago. However, listener hours only rose 1.7% M/M (in spite of an extra day) to 1.73B. On a Y/Y basis, they rose 28%. Pandora's share of total U.S. radio listening (influenced by seasonality) was 9.13%, down from 9.28% in April and up from 7.29% a year ago. The numbers come amid worries about the Apple/Beats deal, an expected iTunes Radio revamp, and Amazon's reported plans to launch a streaming music service bundled with Prime subscriptions. MacRumors observes Apple has replaced Yahoo (YHOO +0.3%) as the data provider for its pre-installed iPhone Weather app in iOS 8 (due this fall), in favor of The Weather Channel. Though Yahoo claims to have 400M+ mobile monthly active users, many of them stem from its data integration deals for the iPhone's Weather and Stocks apps, which feature no ads. Apple's move comes in spite of a 2013 WSJ report stating the mobile giant and Yahoo were discussing an expanded iOS partnership. The change coincides with a decision to replace Google as the Web search provider for iOS/Mac OS' Spotlight search feature in favor of Bing. Yahoo's own Weather app has been widely praised. The real deal is try to advance on SS pay. The politicians think everyone is using it as a bonus. Fact is the rich are the only ones that get a reasonable amount, like minimum wage there should be a minimum at least equal to minimum wage. My mother get less than $300 per month and most get about $700. Low wages never go away and those bigger checks to the undeserving mess up the average just like all the distorted statistics. Different from most people I saw my situation coming even though I had no control or solution, biggest problem was timing, needed to happen 20 years ago. Shadowfax commentary from the other day. I am not seeing AAPL going south any time soon ??? Neither do I but most stock fail after a split. My point was if holding a profit get out and wait for the dust to settle. The negative for them is they still have nothing new and nothing in the works. Health kit is a gimmick for those with extra money and it end in the junk draw or unused app. 90% have no money for something they don't need. Will insurance buy it? NO! The next big deal in digits is if they can a multilevel chip, the problem is heat. AAPL doesn't make or develop chips, they buy them! Could be more slog with the masses broke. Wait 6 minutes! Fed will stir it up. AAPL/Albo – I agree, I said a long time ago that AAPL would make a major play in mobile payments. All a credit card is is a means to identify you as a person with available credit – your phone can certainly do that – and a lot better than a CC – even one with a chip – can. Since pretty much everyone has a phone – they can just flip a switch to offer the service but it's all part of that boring eco-system they have the developers working on. Maybe not so boring as it seems investors have already caught on today that the sell-off was silly. SS/Shadow – That's another horrifically broken system. Quiet/Palotay – I think a lot of people took my advice, cashed out and took a vacation. Oil failing $102.75 again – interesting. Indexes seem happy though. FSLR/phil – seems like an outsized pop on the chinese solar panel tariff. see a downside play or were they just waiting for any excuse to move up more? No talk so another my mom at 90. Rounding up she get $300 per month, she gets to buy the fantastic Federal insurance plan. So first $109 per month for Medicare required for 80% of all medical and over $500 per month for the Federal plan and she still pays copays on the drugs. Wake up everyone this is broken big time. Seems like some improvement but nothing exciting (I'll highlight next). Seems like a forced upside reaction to me and I like /NQ 3,750 for a short entry confirmed by RUT failing 1,130 (/TF) and /ES under 1,930 and Dow is now 16,727 and needs to stay under 16,750 and, of course, it would be nice to see /YM fail 16,700 again. Oil $102.71 after testing $102.60. No one buying or selling the B book. Take cover and walk out slowly. This could move big if someone significant flinches. Re: bonds, seems they're packaging junk bonds into CLOs and calling them AAA, sounds sort of familiar ? Ought to go well if interest rates start going up, although maybe if the bond prices would go down along with rising interest rates, that would hurt bondholders but wouldn't necessarily say anything about the creditworthiness of the issuers. I wonder, if interest rates rise and crush the bond markets, what happens to stocks? Would people rotate out of bonds and into stocks? But then again, rising interest rates are a bad deal for current bondholders but makes new bonds look more attractive? Pharmboy what are you thoughts on EDAP. They are up 13% today as they raise money to fund upcoming regulatory reviews for their prostate cancer drug. I have been holding them for about a year and my cost is $4.00. Do you like them and if so do you have any play on them? Thanks. Let's see, if the bond market tanks…..and the bond market is 2X that of the equity market…. TD Ameritrade Ques. My advisor switched to TD and has both my IRA's there. For the life of me, I can't figure out how to see if my account value is higher or lower YTD. Anyway to do this using the tdameritrade.com site? I don't want complex info, closed/unsettled/etc. Just a nice little graph or summary of balance would be great. EDAP/jc – apologies, but I do not know as much about the device industry. Looks interesting, and leasing equipment and then selling disposables is a good way to go. They just need to keep up with technology changes. (On a side note, I did start a medical device company years ago, and it is alive and well, but it is stiff competition). This situation is repeated by millions that cut up their cards when they couldn't control themselves. http://finance.yahoo.com/blogs/daily-ticker/expensive-to-be-poor-payday-lending-underbanked-153951523.html There is a key statement of you must do the right thing or the dream is dead, hard work isn't enough. http://finance.yahoo.com/blogs/daily-ticker/the-american-dream-isn-t-as-dead-as-it-sounds-152802749.html Wonder if the politicians are reading or listening to these. Prepared at the Federal Reserve Bank of New York and based on information collected on or before May 23, 2014. This document summarizes comments received from businesses and other contacts outside the Federal Reserve and is not a commentary on the views of Federal Reserve officials. As usual, green is clearly good (for the market, not nec for people), red is clearly bad and purple is BS Fed nonsense. Oh – and blue is my commentary! All twelve Federal Reserve Districts report that economic activity expanded during the current reporting period. The pace of growth was characterized as moderate in the Boston, New York, Richmond, Chicago, Minneapolis, Dallas, and San Francisco Districts, and modest in the remaining regions. Compared with the previous report, the pace of growth picked up in the Cleveland and St. Louis Districts but slowed slightly in the Kansas City District. Consumer spending expanded across almost all Districts, to varying degrees. Non-auto retail sales grew at a moderate pace across most of the country: Although improved weather generally gave a boost to business, lingering wintry weather in the Northeast continued to weigh on sales in parts of the Boston and New York Districts. Increasingly strong new vehicle sales were reported by more than half the Districts, with most other regions seeing steady sales; demand was generally reported to be less robust for used vehicles than for new vehicles. Tourism was steady to stronger across most of the country--particularly in most of the eastern seaboard Districts. A lot of couching language and again – I wouldn't have a problem with it if the market wasn't at an all-time high, when you'd expect to see things like "rapid expansion" " above average in ALL districts" as opposed to the above. And weather? In May??? Note at the top of the MONTHLY report this is based on information gathered up to May 23rd. What weather held back the economy between April 23rd and May 23rd? BS excuses are not what you want to hear in a BBook report. Activity in the service sector, excluding finance, grew across most reporting Districts, though New York and San Francisco reported a mixed performance. Boston, Kansas City, and San Francisco noted particular strength among technology firms. Transportation activity strengthened in most Districts reporting on that sector, with Richmond and Atlanta observing brisk growth in port activity, and Cleveland noting a rebound from weather-related weakness in the prior report. Manufacturing activity expanded throughout the nation, and at an increasingly strong pace in a number of Districts--notably along the East Coast, as well as in the St. Louis and Kansas City Districts. Residential real estate activity was mixed across the country, with some reports of low inventories constraining sales--specifically in the Boston, New York, and Kansas City Districts. Still, home prices continued to increase across most of the country, while the markets for both condos and apartment rentals were mostly robust. Residential construction activity was mixed, with half the Districts reporting increases but a few indicating some weakening in activity; multi-family construction remained particularly robust. Both non-residential construction activity and commercial real estate markets were generally steady to stronger since the last report. Again, we don't want to hear "mixed" and "some weakening activity" when we're trying to understand why the market should be at an all-time high, do we? Also, with auto sales – keep in mind we're coming off 5 very slow years and rates are at record lows and incentives are at record highs – they'd BETTER be flying out of the showrooms or something is very, very wrong! Overall lending activity increased throughout the nation. Roughly two-thirds of the Districts reported rising loan demand, with particular strength reported in New York and San Francisco. Credit quality and delinquency rates generally improved, while credit standards were mostly unchanged. Among Districts reporting on agriculture, drought conditions caused problems in the Dallas and San Francisco Districts, and, to a lesser extent, in the Chicago District; conversely, Atlanta and Minneapolis reported that excessive moisture delayed plantings. Energy industry activity strengthened in most Districts, though coal production was steady in Cleveland and declined in the Richmond District. Labor market conditions generally strengthened in the latest reporting period, with hiring activity steady to stronger across most of the country, and several Districts reporting shortages of skilled workers. In most Districts, wage increases have remained generally subdued, though Chicago and Dallas noted increased costs for health benefits. Prices of both inputs and finished goods and services were mostly steady to up slightly. Consumer spending grew at a moderate pace over the latest reporting period, with a mixed performance among non-auto retailers but brisk growth in vehicle sales and moderate growth in tourism. Non-auto retail sales were characterized as mixed and generally lackluster in the Boston, Atlanta, and San Francisco Districts, but growing modestly or moderately across the rest of the country. Kansas City noted some deceleration in sales. While lingering cold and wet weather was cited as somewhat of a negative factor in the Boston and New York Districts, it was characterized as less of a restraint than earlier in both these Districts and in the Cleveland, Chicago, and Dallas Districts. A number of Districts also noted that the later Easter combined with the late arrival of warm weather had the effect of delaying the spring shopping season. Chicago, Kansas City and San Francisco reported relative strength in spending on home-related merchandise, while St. Louis mentioned strong restaurant business. New vehicle sales were generally described as robust in the latest reporting period, while sales of used cars and trucks continued to lag. New York, Philadelphia, Cleveland, Atlanta, St. Louis, Dallas and San Francisco reported moderate to robust growth in new vehicle sales, while Richmond, Chicago, Minneapolis, and Kansas City described sales as generally steady or mixed. Cleveland and San Francisco reported some growth in sales of used vehicles, while New York reported a mixed performance. Auto dealers generally expressed optimism about the near term outlook. Tourism was seen as fairly strong across most of the country in recent weeks. The Boston, New York, Richmond, Atlanta, Minneapolis Districts reported increasingly robust tourism activity, and Philadelphia noted slight growth; Dallas observed a pickup in passenger airline demand. On the other hand, tourism activity was seen weakening somewhat in the Kansas City and San Francisco Districts. New York and Philadelphia attributed some of the pickup to the marked improvement in weather driving pent-up demand, Boston credited the 2014 Marathon for much of the strength in April, and Atlanta cited strength in international visitors. Nonfinancial services activity generally strengthened since the previous report. The Philadelphia, Richmond, Minneapolis, Kansas City, and Dallas Districts reported that service-sector activity expanded, on balance, while such activity was reported to be mixed in the New York and San Francisco Districts. St. Louis noted that reports of planned service sector activity have been positive. Business activity strengthened for technology service firms in the Boston, Kansas City, and San Francisco Districts, while Dallas reported that demand for accounting services remained steady at a high level. Activity in the food services industry continued to decline in the San Francisco District. Reports on goods transportation services were largely positive. Increased shipments and cargo volumes were noted in the Cleveland, Richmond, Atlanta, Minneapolis, Kansas City, and Dallas Districts. Following a difficult winter, contacts in Cleveland reported strengthening demand for shipments of motor vehicles, chemical products, and construction-related materials. Port activity grew briskly in the Richmond and Atlanta Districts, particularly for auto-related products and containerized cargo. Railroad shipments increased in the Atlanta and Minneapolis Districts, while intermodal traffic expanded in the Atlanta and Dallas Districts. Airline passenger demand improved in the Dallas District. Manufacturing activity expanded in all twelve Districts since the previous report, with a pickup in the pace of growth reported in several Districts. Activity expanded robustly in the Boston, New York, Atlanta, and Kansas City Districts, while a more modest pace of growth was reported by Chicago, St. Louis, Philadelphia, Cleveland, Dallas, and Minneapolis. Activity expanded more slowly in the Richmond and San Francisco Districts. Growth was especially strong for several Districts in activity related to motor vehicles, aerospace, and metals. By contrast, construction-related manufacturing activity was mixed. Philadelphia reported weakness in this sector, and Chicago and Kansas City noted some strength, while demand for construction-related materials was mixed in the Dallas District. Demand for semiconductors increased modestly in the San Francisco District. Chicago and Cleveland noted strength in energy-related industries, and refinery utilization rates rose in the Dallas District. Steel production was up slightly in Cleveland, where activity related to oil and gas was also reported to be strong. The Richmond District noted declining sales for machinery, textiles, rubber and plastics, and San Francisco noted a slowing in the pace of new orders among defense-related manufacturers. Some very strong green lines but still with a bit of red thrown in and, on balance, I couldn't say the end of the last paragraph was bullish. Again, keep in mind that, if the market had recently sold off 20% and this was the report – I'd be thrilled. But it hasn't, we were at 1,737 on the S&P in early Feb and now, 4 months later, we're at 1,925 and that's up 10.8% in 4 months (from the low) and this report DOES NOT JUSTIFY being at the top of a 10% trading range – especially when the top of that range is an all-time high. Then you have to remember that this is how we're performing WITH MASSIVE STIMULUS – the training wheels are still on the bike – what happens when we kick them off? Residential real estate activity has been mixed since the last report, with a lack of inventory at times cited as a constraining factor. Boston, New York, and Kansas City indicated that existing home sales were being held back due to low or dwindling inventories. Sales rose modestly in the Cleveland, Richmond, Atlanta, Chicago, and Dallas Districts, with inventories described as low in Richmond and Chicago and declining in Cleveland. Sales activity, however, softened in the Philadelphia, St. Louis, Minneapolis, and San Francisco Districts, though Philadelphia did note some signs of improvement in May. San Francisco attributed some of the weakness to severe weather. Home prices continued to increase across most of the Districts; Boston reported some pullback in prices of single-family homes, though condo prices in that District, as well as in New York, rose. New York, Chicago, and Dallas reported strengthening demand for apartment rentals, whereas Boston noted some slackening in demand. Homebuilders gave mixed reports on new home sales and construction in recent weeks: Residential construction strengthened, to varying degrees in the New York, Richmond, Atlanta, Chicago, Kansas City, and Dallas Districts. However, Philadelphia, St. Louis, and Minneapolis indicated some weakening in new home sales and construction. Overall residential construction activity was mixed across the San Francisco District, though contacts there expect activity will increase over the next year. Both Boston and New York reported a good deal of recent multi-family development at the high end of the market, while Cleveland, Richmond, Atlanta, Chicago, and Dallas noted strength in multi-family construction more generally. Non-residential construction activity was steady to stronger in most Districts over the latest reporting period, with strengthening reported in the Boston, St. Louis, and Kansas City Districts. Cleveland described pipeline activity as strong, and San Francisco noted that a number of public and commercial high rise projects have been announced or are underway. In contrast, Minneapolis reported a decline in non-residential construction activity, and Philadelphia characterized it as steady at a low level; Chicago described activity as mixed--with office construction weak but industrial and some segments of retail fairly strong. The commercial real estate market was mostly stronger since the last report. Leasing activity and vacancy rates improved in the Richmond, Atlanta, Chicago, Minneapolis, Kansas City, Dallas, and San Francisco Districts, and were generally steady in the Boston, New York, Philadelphia, and St. Louis Districts. Dallas described market conditions as robust. Now THAT's a positive report! Commercial Real Estate is coming back and that means we now have an investing premise for some REITs like BXP or VNO (but both have taken off already so we'll have to look for hidden gems). Of course this is still being driven by low interest rates – but we'll take it while it lasts. All Districts reporting on banking noted that lending activity increased. Loan demand was reported as strong by New York and San Francisco, while more modest growth was reported by Philadelphia, Richmond, Chicago, St. Louis, Kansas City, and Dallas. Commercial and industrial loans grew in the Philadelphia, Richmond, Chicago, and Kansas City Districts. On the consumer lending side, several Districts noted that the demand for auto loans was particularly strong, including Cleveland, Atlanta, Chicago, Dallas, and San Francisco, though such lending was reported to be up only slightly in the St. Louis District. Residential real estate lending increased in the Chicago, Kansas City, and Dallas Districts, while mortgage lending activity was reported as holding steady in the Atlanta and San Francisco Districts. By contrast, both Cleveland and Richmond reported slightly weaker mortgage lending activity, and New York and Richmond reported a decline in mortgage refinancing. Credit quality was reported as strong in the San Francisco District, loan quality improved in the Philadelphia and Dallas Districts, and delinquency rates were somewhat lower in the New York, Cleveland, and St. Louis Districts. Credit quality was reported as stable by Richmond and Kansas City. Credit standards were seen as largely unchanged in the New York, Philadelphia, Cleveland, and Kansas City Districts, while St. Louis reported that credit standards for commercial and industrial loans had eased slightly. Agriculture conditions proved challenging in many Districts, with drought conditions reported by some Districts and excessive moisture reported in others. Drought conditions existed in parts of the San Francisco District, particularly in California and Arizona, resulting in a reduction in crop plantings and reduced herd sizes. Dallas also noted widespread drought conditions, especially in the Texas panhandle, as did the Chicago District in parts of Iowa. On the other hand, rains delayed plantings of crops in parts of the Atlanta and Minneapolis Districts. Planting progressed well overall in the Chicago District and in Idaho as reported by San Francisco. Minneapolis and San Francisco reported a loss of hogs due to a fatal virus, contributing to higher hog prices. More generally, low cattle supplies and strong demand resulted in high beef prices in Minneapolis and Kansas City. Both Kansas City and Dallas reported problems with the quality and quantity of the winter wheat crop, though winter wheat crops were generally in good condition in the St. Louis District. Activity in the energy industry generally increased since the previous report. Atlanta and San Francisco reported that crude oil production expanded strongly, and Dallas noted that the demand for oilfield services was robust. Natural gas production climbed in the Richmond and Atlanta Districts. Minneapolis highlighted a number of recent or planned projects to expand energy production capacity. St. Louis reported that coal production was up from year ago levels, while coal production held steady in the Cleveland District but fell in the Richmond District. Coal production is up? You wouldn't know it from BTU. That crop and cattle situation is BIG TROUBLE for later in the year – we need to keep an eye on food inflation. 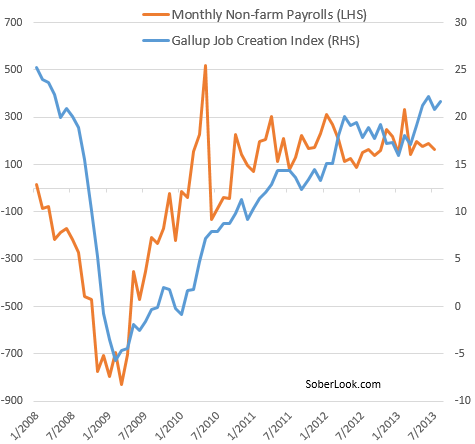 Labor market conditions generally improved since the previous report. The Boston, New York, Cleveland, Richmond, Atlanta, Chicago, St. Louis, Minneapolis, and Dallas Districts indicated that employment levels were flat to up modestly. Philadelphia reported that some new hiring occurred but noted that firms remain cautious, while improvement in the labor market has led to increased competition for workers in the Kansas City District. Contacts in the Cleveland and Chicago Districts noted an increase in demand for some temporary workers, while the Atlanta District reported a small increase in workers transitioning from temporary to permanent positions. Several Districts continued to report that employers were having difficulty finding skilled workers. Most Districts reported that wage pressures remained subdued since the previous report, although an increase in the cost of health insurance was noted in Chicago and Dallas. According to reports from the New York, Philadelphia, Richmond, Minneapolis, Kansas City, Dallas, and San Francisco Districts, to the extent that wage increases were observed, they were concentrated among highly skilled workers in information technology, engineering, professional services, and some of the skilled trades. Price pressures were said to be contained, as most Districts reported that both input and finished goods prices were little changed or up only slightly since the previous report. However, high or rising prices for some agricultural commodities, construction materials, energy products, and precious metals were cited by some Districts. Contacts in the Boston, Cleveland, Chicago, Dallas, and San Francisco Districts noted higher food prices, particularly for meat and dairy products. By contrast, Chicago reported that corn, wheat, and hog prices declined, and Dallas reported that fuel costs declined for a transportation services firm. 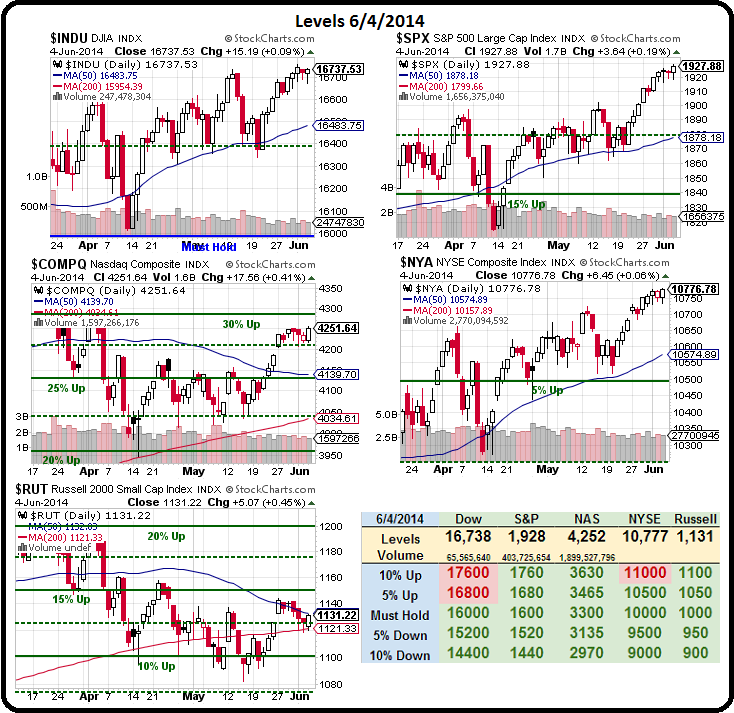 On the whole, the report is not terribly strong and certainly doesn't justify today's pop higher in the indexes. I stand by my shorting lines (see above) and, if Draghi fails to come through with some extra-strong fairy dust tomorrow – there's likely to be quite a stampede to the exits into the weekend. FSLR/Scott – Well it is a big plus for them. 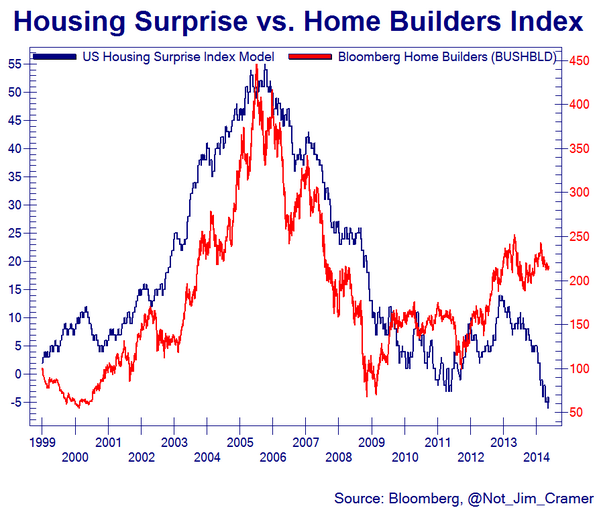 I am surprised that investors are surprised as this has been in the work for months but what can you do? We last had a bearish earnings play on them in the STP and we're short the July $75 calls but we also have the Jan $77.50/85 bull call spreads so it's actually to our benefit if they get back to the low $70s. Nothing to worry about at the moment. $102.50 breaks again on /CL. Bonds/Pwright – A lot of if-thens in any scenario and then, no matter what, you always have the wildcard of Central Bank intervention. If the bond market does collapse, I don't see money moving to stocks – the rising rates will kill all these idiot companies that did buybacks and M&As when they should have saved their cash (like AAPL). Ameritrade/Burr – Just give them a call, they have good support. I never use the .com site. TNA/Phil – up 14% in a day from the 1.40 fills on Jul 76.81 calls.. Now that BB wasn't so strong, take these off? Phil and Pharm re: bonds, thanks, that makes sense. Seems like it keeps coming back to the story of too much money sloshing around. Phil, Are we still holding USO puts? ANAD – Another one of my falling knives, which kept on falling, seeing some strength today on good volume. Please take Phil's advice today on cash. This is not only record low volume it is off the charts for a B book day. Lots of 1 share trades, no investor buys 1 share meaning no investors at all. Shorting means hanging from your tie as pharm shows but something is very wrong. TNA/Scott – Not ahead of Draghi tomorrow. Who knows what he'll actually do but this is not a market that wants to go down. You're welcome Pwright, way too much money in the hands of too few. USO/Zten – Gotta give it another day now. ANAD/Albo – I don't know how you guys keep track of all these little companies. Volume in last minute RED!!!!! FSLR/Stockbern – Icahn rumor.. good grief! bot fodder? It’s not about being right or wrong. It’s about making profits. I guess that’s what the majority is here for. U.S. stocks rose, with benchmark indexes at record levels, amid better-than-forecast data on service industries before a European Central Bank decision on stimulus and a monthly employment report. President Vladimir Putin offered the first face-to-face talks with Barack Obama since pro-Russian separatists unleashed an insurgency that’s claimed almost 200 lives in Ukraine. Amazon.com Inc. (AMZN)’s sales contracts with some of the world’s biggest publishers, Simon & Schuster and HarperCollins, are next up for renewal, signaling that skirmishes over e-book pricing are set to spread. President Barack Obama’s newly proposed power plant CO2 rules ignited coal-fired rage in some parts of the U.S. this week. From abroad comes muted applause and relief. The U.S. announcement could tilt the goal of UN climate change negotiations, away from an “international, legally binding” treaty, to a patchwork of national commitments. Pacts like the Kyoto Protocol, which the U.S. Senate blocked by a 95-0 vote in 1997, are probably a thing of the past, said former UN climate chief Yvo De Boer. He is now director-general of the Global Green Growth Institute in Seoul. De Boer and I spoke last week about the Obama administration’s plans and the highly anticipated UN negotiations in Paris at the end of 2015. Preliminary talks are being held in Bonn, beginning today. Q: Is it still realistic for climate negotiators to want an “international, legally binding” treaty? Was it ever realistic if the U.S. always opposed one? A: If a country enters into a legally-binding commitment and they back away from it, what do you do? Arrest the prime minister? “Nationally legally-binding” is much stronger. I think we’ve moved beyond Kyoto-style agreements. Hopefully in Paris we will see countries make ambitious pledges to limit or reduce emissions. Q: What’s the significance of the prosed U.S. power plant rules for the UN negotiations? A: They’re very significant because they can potentially demonstrate how the United States will give meaning to its ambitions. If the U.S. feels that “internationally legally binding” has little value, and that the real value lies in legally-binding national commitments, then these regulations can be the way for the U.S. to show leadership. Q: What’s the deal with American Republicans and climate change? A: I remember George W. Bush at the beginning of his first term being extremely critical of climate change as an issue. I remember Condoleezza Rice joyfully calling the EU ambassadors into her office and saying Kyoto was dead. And by the end of the second term, Bush was saying that climate change was a global issue that requires a global response. So we all have our learning curves and conservatives are not immune to learning. Q: Do you think people are getting UN climate talks fatigue? The wrangling seems endless. A: I think they are. I often have the feeling that the climate talks are a lot like those terrible American soap operas where every episode is incredibly exciting but if you don’t watch for 2 years, you don’t miss anything. That’s why I think political leaders engaging in the UN Secretary-General’s [September] summit, and political leadership in Paris, is so critical. Q: How important are the U.S. and China to an agreement? A: Everything revolves around China and the United States. Much of what is agreed in Paris will flow from a U.S.-Sino willingness to engage. Q: How can organisations like your own, the Global Green Growth Institute, add to the global effort to fight climate change? A: What the GGGI does is help countries to assess where climate policy makes sense, and where it doesn’t, and how they can turn that understanding into real policies and programs, that they can then go out and look for financing for. Q: What ways do you see for countries to increase ambition to tackle climate change pre-2020? A: Increasing pre-2020 ambition is incredibly difficult. Most countries are just beginning to emerge from the economic crisis. Money is tight in many parts of the world and often environmental policy is seen as making money tighter. Morales covers climate change and renewable energy for Bloomberg News in London. Visit The Grid for the latest about energy, natural resources and global business. Will Alibaba IPO See Good Fortune of No. 8? Online shoppers often fill up their carts and bail at the last minute when the bill comes. Usually it’s because they can’t remember their log-in, don’t have their wallets handy or can’t bear to fill out a credit-card form. A Swedish startup called Klarna has discovered a way to get people to complete more purchases over the Internet: Don’t ask for money up front. retailer deeper into the competitive mobile-device market. after a dismal first quarter. Euro-area economic growth slowed to start the year, keeping pressure on the European Central Bank to act as soon as tomorrow to spur the fragile recovery and spark prices. recovery, according to a draft statement. President Barack Obama released this week his much-anticipated regulations for controlling carbon emissions. Opponents are claiming the new rules are so onerous they will imperil the electric utility industry. SunPower (SPWR) is offering $400M worth of convertible senior notes due June 2021. Total (TOT), which owns 60% of SunPower, has committed to buying $250M of the notes. Potential uses of the funds include capex, paying down existing debt, and pursuing SunPower’s HoldCo strategy, under which the company is creating a solar project subsidiary that in turn could sell a stake (possibly through an IPO). SunEdison announced a $500M convertible offering earlier today; the majority of its proceeds will go to the company’s TerraForm Power (YieldCo) spinoff. SunPower rose 7% in regular trading, thanks to the DOC’s tariff announcement. The company had $900M in debt at the end of Q1, and $1.32B in cash/investments. Stocks shook off early weakness to edge higher, with the S&P 500 closing at a record high for the 16th time this year, as a mixed bag of economic reports showed the U.S. services sector rising more than expected in May while private-sector job creation failed to live up to expectations. Stocks maintained gains after the release of the Fed’s Beige Book of regional business conditions, which found expansion in all of the Fed’s 12 districts. Trading volume remained light, with just 579M shares changing hands at the NYSE vs. a long-term average of ~700M. Apple’s 1.1% gain aided the tech sector as well as the relative strength of the Nasdaq, which also drew strength from biotechs as the top biotech ETF regained its 100-day MA with a 1% jump. Treasury prices closed lower, pushing benchmark yields to their first five-day rise since last June; the 10-year yield settled at ~2.60%. Dow +0.08% to 16,735.86. S&P +0.18% to 1,927.70. Nasdaq +0.41% to 4,251.64. Treasurys: 30-year -0.09%. 10-yr -0.07%. 5-yr -0.02%. Commodities: Crude -0.22% to $102.44. Gold -0.07% to $1,243.60. Currencies: Euro -0.22% vs. dollar. Yen +0.21%. Pound +0.08%. Foreign copper miners in Indonesia have agreed in principle to pay an export tax, the country’s deputy finance minister says, following talks aimed at restarting concentrate exports after a five-month halt. Freeport-McMoRan (FCX +1.5%) and Newmont Mining (NEM +0.4%), which together account for 97% of Indonesia’s copper output, had argued they should be exempt from the tax as introduced in January, which kicks in at 25% and rises to 60% in 2016 before a total concentrate export ban in 2017. Copper for July delivery, the most actively traded contract, suffers its biggest one-day drop since April as a resolution nears; also there are concerns that a probe of metals warehousing at a Chinese port could hurt demand if China clamps down on copper-based financing. U.S. Steel surges as analyst issues bright outlook for steel in… Japan? A bullish outlook on steel released in Japan by Credit Suisse could be moving sector stocks in the U.S., Barron’s Ben Levisohn writes, even though conditions for the U.S. industry don’t look especially promising. U.S. Steel (X +3.9%) is enjoying its biggest one-day percentage gain since Dec. 23; some sources cite news of its idling two plants in Texas and Pennsylvania that produce tubular products for the oil and gas industries, but that was announced two days ago. Suggesting investors tread lightly on steel stocks, Wells Fargo analysts expect steel imports to remain at elevated levels as domestic vs. international price spreads are more than $100/ton across all flat and long products; imports typically increase when U.S. pricing is at a greater than $100 premium. Also: AKS +3.4%, SCHN +1.7%, CMC +0.8%, STLD +0.3%, NUE -0.2%. Bloomberg reports Medtronic (MDT +3.8%) is mulling a buyout offer for knee/hip implant maker Smith & Nephew (SNN +8.6%). SNN and i-banks are said to be “aware of Medtronic’s interest.”. The news service cautions Medtronic’s prep work is at an early stage, and that “no offer is imminent.” Nonetheless, Medtronic is viewed as “a more serious bidder” for SNN than Stryker (SYK -0.1%), previously rumored to be weighing an offer. Sources state a deal would likely result in Medtronic using SNN’s corporate shell to change its legal residence to the U.K., and thereby take advantage of lower tax rates. Medtronic, which has a large offshore cash balance, has previously said it’s open to a tax-inversion deal. Shares of both companies have spiked higher following the report. SNN’s market cap is currently at $17B. A day after AT&T (T -0.7%) sold $2B worth of 30-year U.S. bonds to help pay for the DirecTV (DTV -0.1%) deal, Bloomberg reports the company is selling $2.9B worth of euro-denominated bonds with 10 and 20-year maturities. Assuming no funds are used to repurchase debt, the offerings stand to raise AT&T’s debt load to the ~$85B range. DirecTV, meanwhile, has $20.8B of its own debt, partly offset by $5B in cash/investments. Separately, in an 8-K outlining its case for the acquisition, AT&T declares content costs eat up 60% of U-verse’s revenue, and that DirecTV’s scale will lower those costs by ~20%. $1.6B/year worth of total synergies are expected 3 years after the deal closes. AT&T also claims the deal will allow it to provide gigabit fiber services (previous) to 2M more locations, and that it plans to offer TV/broadband bundles in Latin America with the help of DirecTV’s spectrum, which covers 43M homes in Brazil, Argentina, Peru, and Colombia. Adjusted EBITDA of $32.2M vs. $37.1M a year ago. Drexel Hamilton’s Richard Whittington has joined the list of analysts praising Broadcom’s (BRCM +2%) plans to exit the baseband chip market, upgrading shares to Buy and lifting its PT by $15 to $45. Whittington has upped his 2014 EPS estimate by $0.18 to $2.58 (above a $2.54 consensus). He also sees Broadcom benefiting from Apple, Google, and Samsung’s home/auto connectivity initiatives – the company was one of many partners mentioned by Apple when the company unveiled its HomeKit automation platform on Monday. Stifel downgraded Broadcom to Hold yesterday; like Wells Fargo, it’s worried a baseband exit could lead to combo chip share losses. Separately, Taiwan’s Economic Daily News states MediaTek is “likely” to buy Broadcom’s baseband unit, which many think will be shut down rather than sold. It’s worth noting MediaTek already has an extensive lineup of 3G basebands, and is getting ready to ramp shipments of a 4G part. AvalonBay (AVB +0.3%) CEO Timothy Naughton (webcast): He expects apartment supply growth of about 5% over the next three years, but that demand growth will be there to meet it. Giving a mid-quarter update for AVB, everything so far is inline with management’s expectations. Effective rents in AVB’s markets are growing 3-4% and trending positively through the year – May was much stronger than April which was better than March. Leading the way is Northern CA, and Seattle with rent growth of 6-7%. Mid-Atlantic trails the pack with flat growth. Yesterday was a day of reprieve, today was not clean and defragment your computer, and especially delete cookies. You don't need any expensive programs, they just do what is free, and you can run them while doing anything else. The cleaning slows down not your browsing. Last AAPL super what you think is not immune. Forgot this attack is business computing of all types. anyone know why GTAT lost 13 points MOC with high volume today ? S&P and NYSE making new highs… Russell trapped between the 50 and 200 DMA but something has to give in the coming days as the 2 averages will cross! You wouldn’t know it after reading any major financial publication yesterday, but the average U.S. stock is down over -1% thus far in 2014. But how can that be if we’re being told almost daily that the Dow and S&P 500 are hitting new all-time highs? The answer is likely to surprise you, especially if you have been focused solely on the large cap space. There is a massive divergence going on between the haves and have-nots, or the largest capitalization stocks and the rest of the equity market. As the table below indicates, the 50 largest stocks in the Russell 3000 are up 4.1% in 2014 while the average return for the rest of Index (51-3000) is -1.1%. Since the small cap index (Russell 2000) peaked back on March 4, the divergence has been starker, with the 50 largest stocks up 3.8% while the rest of the index is down -4.9%. 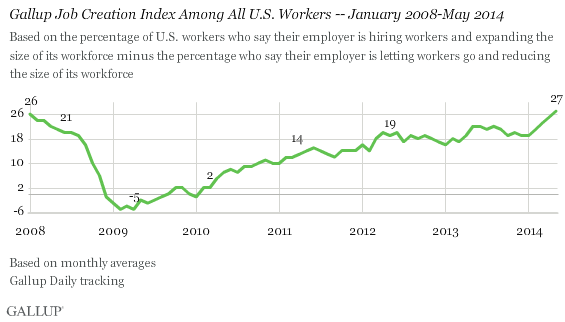 PRINCETON, NJ — Gallup’s U.S. Job Creation Index reached a new high in its more than six-year trend, registering +27 in May. The prior high had been +26 in the initial monthly measurement of January 2008, just as the recession was taking hold. The index is based on employee reports of hiring activity at their places of employment. May 27 (Bloomberg) — Bank of England Governor Mark Carney speaks about the tension between pure free-market capitalism and social capital, and a list of steps to repair the ethos of the global financial system. battle to keep Bank of England policy loose: Mario Draghi. June 5 (Bloomberg) — John Wraith, a fixed-income strategist at Bank of America Merrill Lynch, looks ahead to today’s European Central Bank policy decision and discusses the prospects for quantitative easing. Here are five things to watch for from Mario Draghi today. The European Central Bank president holds a press conference 45 minutes after the rate announcement at 1:45 p.m. in Frankfurt. the bank’s largest commitment to a city. the charm for its mobile-phone comeback. June 2 (Bloomberg) — Neil Jones, head of hedge-fund sales at Mizuho Bank Ltd. talks about the yen versus the dollar and the outlook for Bank of Japan policy. stocks rose, Treasuries gained and commodities fell. Central Bank will cut its deposit rate to below zero today. The chart below shows the long-term historical P/E ratio for the S&P 500. At a current level of 17.31, the trailing P/E ratio is nearly two points above its historical average (15.35: red line). While the market is 'expensive' compared to its long-term historical average, compared to short-term time frames, the market's valuation is more mixed. Over the last 25 years, the S&P 500's average P/E ratio (18.90) is more than 1.5 points above the current valuation, but compared to just the last decade the current P/E ratio for the S&P 500 is modestly above average (16.95). 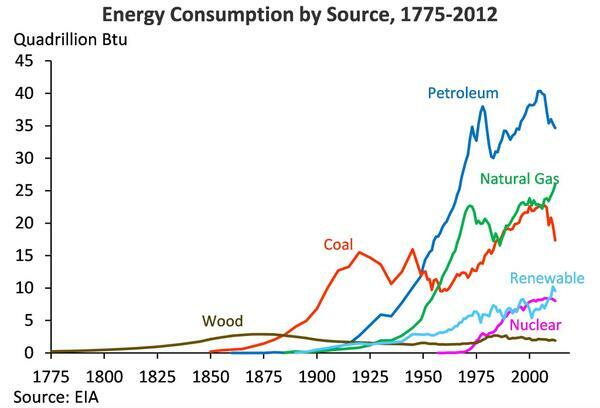 fossil fuels as a means of powering cars, homes and businesses. June 4 (Bloomberg) — Organization for Economic Cooperation and Development Secretary-General Angel Gurria talks about the global economy and environmental issues. Economic growth in the northern Chinese city of Taiyuan, Shanxi province, has crashed to zero from 12 percent in one year. Yan Xiaofeng’s coal-equipment business has gone down with it. debt, the International Monetary Fund said. that growth in Europe’s largest economy remains on track. The pinnacles of the Petronas Twin Towers protrude through low clouds in Kuala Lumpur. From missing airplanes to jail-bound opposition leaders, Malaysia has recently made international headlines for all the wrong reasons. Will the nation’s economy be next? The IMF’s Deputy Managing Director David Lipton has pressed China to lower its growth target next year to 7% as a result of reforms that can reduce its size in the near term. China has already set a growth target of about 7.5% for this year, compared with 7.7% last year. Despite the challenges, Acton believes the $19B buyout from Facebook (FB) will send 1B new users to his social network and generate substantial revenues. Microsoft (MSFT) has declared that it will reduce the prices on its tablets and smartphones this year. Prices on the company’s 7, 8, and 10-inch devices are planned to sell at the $100-$300 range instead of the $300-$500 range, and some Windows smartphones will also sell for under $200 in certain markets. The price cuts for the Windows 8 devices come as the company attempts to gain a greater market share in the mobile sector. Currently, Microsoft is battling Google who offers its Android operating system for free to handset and tablet developers. RadioShack (RSH) will announce a partnership today with PCH International, an Ireland-based company. PCH helps companies design, manufacture and distribute electronic products from facilities in China. The new partnership will aim to boost revenue by bringing a variety of products from start-ups to its stores. The new bet requires minimal inventory due to direct shipping from China, and the start-ups’ hardware will will be displayed in special zones in the front of as many as 2,000 stores starting this summer. In recent years, RadioShack has suffered record losses due to competition with online retailers in the consumer electronics sector. Wireless carriers have also ate away at the company’s mobile phone sales. RadioShack reported a $400M loss in 2013. Lenovo (LNVGF) and IBM (IBM) are looking to extend their deal deadline, as the Committee on Foreign Investment in the United States (CFIUS) continues the review of Lenovo’s planned purchase of IBM’s low-end server unit for $2.3B. The CFIUS assesses acquisitions for their national-security implications, and the deal between China-based Lenovo and IBM comes at a time of tensions between the U.S. and China over spying and hacking claims. IBM CEO Ginni Rometty has stressed the importance of the deal, and how it could stage a comeback for IBM, as users increasingly change to cloud-computing, reducing the need for servers and mainframes. If approved, Lenovo has stated that the companies can seal the deal by the end of the year. BP and Anadarko Petroleum (APC) could be facing billions of dollars in fines after the U.S. Court of Appeals in New Orleans said today the companies are automatically liable under the U.S. Clean Water Act as co-owners of the Macondo well that blew out and started the 2010 Gulf of Mexico oil spill. The court upheld a lower-court decision that allows the U.S. to seek up to $18B in fines from BP if it is found grossly negligent for its actions surrounding the spill; APC faces a maximum of $4.6B. The Clean Water Act allows the government to seek fines of as much as $1,100/bbl spilled on a finding of strict liability and up to $4,300/bbl for gross negligence; the ruling leaves both companies immediately vulnerable to the $1,100/bbl fines. The new Indian government is likely to allow foreign companies to directly invest in the company’s e-commerce market, Reuters reports. Currently, foreign firms are only allowed to run marketplaces for 3rd-party vendors. A policy change could open the door for Amazon (AMZN) to significantly expand its Indian presence, something it has long been interested in doing. Like eBay, Amazon currently runs an Indian e-commerce marketplace. If Amazon gets a green light to sell its own goods, it’ll face tough competition from local leader Flipkart, which recently raised $210M in funding. Snapdeal, a marketplace eBay has taken a big stake in, is also a major player. With rising Web/smartphone adoption providing a boost, CLSA estimates the Indian e-commerce market will grow from $3.1B to $22B in 5 years. Snapdeal CEO Kunal Bahl notes only 0.25% of Indian retail sales currently happen online, compared with 6% for China and 9% for the U.S.
Pres. Putin said today that Russia should consider recapitalizing state-owned Gazprom (OGZPY) after the $400B gas deal with China which will require multi-billion-dollar investments in pipelines and new fields. Putin did not say how exactly Gazprom could be recapitalized but hinted it could be done from Russia’s gold and foreign exchange reserves, the world’s fourth largest, which stood at $468B as of last week. Russia has said it plans to invest $55B in exploration and pipeline construction to China’s border; a Gazprom exec says China would provide a $25B pre-payment. The White House says the U.S. will pause for six months its efforts to reduce Iran’s crude oil sales; in exchange, Iran has agreed to take steps to halt its nuclear program progress. Global crude supplies are sufficient to allow other nations to cut imports from Iran, though efforts to further curtail such sales were on hold while nuclear talks continue, the WH says in a statement required by Congress regarding the global supply of petroleum products from countries other than Iran. Bloomberg reports Sprint (S) and T-Mobile USA (TMUS) are near an agreement for a deal that would value T-Mobile at ~$40/share. The WSJ is also reporting a ~$40/share price. S +3.7% AH. TMUS +3.2% to $36.02 – a price that points to ongoing regulatory worries. 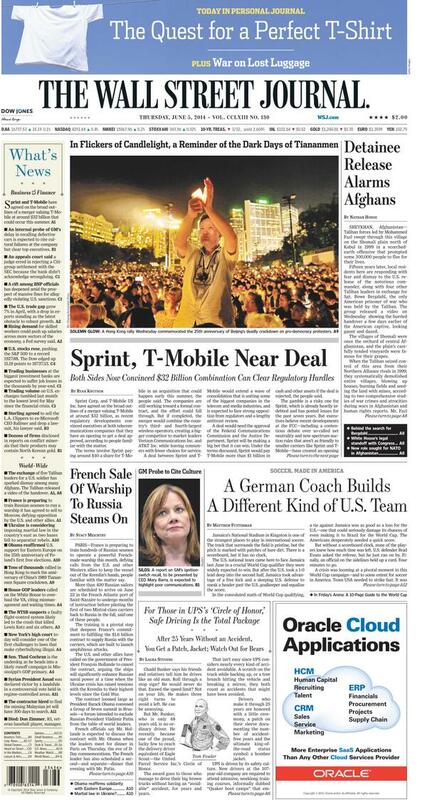 Sprint’s offer will reportedly feature a 50-50 cash/stock split, and leave Deutsche Telekom (DTEGY), which currently owns 67% of T-Mobile, with a 15% stake in the combined company. Bloomberg’s sources state an announcement could happen by July. In addition, the carriers are reportedly close to agreeing on a breakup fee – Sprint and parent SoftBank (SFTBF) have reportedly been pushing for a smaller breakup fee for a deal that’s bound to face tough DOJ/FCC scrutiny; T-Mobile and Deutsche Telekom have wanted a bigger one. In addition to missing FQ1 estimates, PVH has cut its full-year EPS guidance by $0.10 to $7.30-$7.40 (below a $7.51 consensus). Revenue is expected to total $8.5B (in-line with consensus). The apparel brand owner says it’s seeing “heightened promotional activity across the North American retail landscape,” and that this trend will also pressure FQ2 margins. Its fiscal 2H outlook is unchanged. Tommy Hilfiger sales +6% Y/Y to $862M, Calvin Klein +4% to $665M, Heritage Brands -2% to $436M. Retail store comps: +2% Y/Y for Tommy Hilfiger in North America and +6% in Europe; flat for Calvin Klein in North America and -5% international; -11% for Heritage Brands. How messed up is it that we have these "G7" meetings and don't invite China, India, Brazil or Russia – all of whom have GDPs bigger than Italy's or Canada's. By holding these meetings and having them be like a club, we're forcing the others to align against us and the lack of true global cooperation is why we lurch from crisis to crisis the way we do. There’s been a flurry of articles about the dangers of exchange-traded funds. BlackRock Inc.'s Larry Fink said leveraged ETFs could “blow up” the industry, even though they have microscopic assets and own less than 0.02 percent of the derivatives market. There’s also been chatter about potential problems with ETFs that track illiquid assets, such as senior loans, if there's a run for the exits. A recent Ventured & Gained post looked at exchange-traded notes (ETNs) and some risks they pose. While there's no real evidence that ETFs pose a systemic risk, they can hold some pretty exotic stuff. And just because they trade like stocks, that doesn’t mean they're all as liquid or straightforward as stocks. Perhaps the unique dangers of some ETFs should be flagged more prominently. First there was ZIRP. Now get ready for NIRP. The first is “zero interest-rate policy,” the strategy for trying to stimulate economic growth that the United States has undertaken for the last 5 ½ years (and the Bank of Japan much longer than that). The second is “negative interest rate policy.” And that’s what the European Central Bank is likely to put in place on Thursday for the 18 nations that use the euro currency. That, anyway, is the move that leaders of the European bank have telegraphed to markets. That makes this a good moment for the curious mental exercise of pondering what a negative interest rate even means, and why it’s something that monetary policy mavens have been talking about more than they would like over the last half-decade. Why would the E.C.B. do that? Inflation in Europe has fallen far below the 2 percent or so that the central bank aims for, unemployment remains high in much of the continent, and growth sluggish. The central banker’s usual answer to that set of problems is simple: Cut interest rates. But with the E.C.B. already paying zero percent on deposits that banks park with it, the only way to cut rates further is to go into negative territory. The theory is that when it becomes more costly for European banks to keep money in the E.C.B., they will have incentive to do something else with it: Lend it out to consumers or businesses, for example. Or if negative rates make it less attractive for global investors to park money in Europe, it could cause the euro to fall on currency markets, helping reverse a rise in its value that has made European exporters less competitive. What a great example of how people can be controlled through information. On a day when a major policy decision is to be decided in Europe, the WSJ can't find space to discuss it on their front page. This market reminds me of some years ago (2007 was it?) when we spent the whole summer grinding up on low volume in a very narrow range. My delta analysis shows that ES has been in a deep down channel since early March, the entire contract. This is the biggest short divergence I have ever seen, over 320,000 ES contracts. We are coming up to ES roll over too. There must be a significant number of shorts who could trigger a rally if pressed hard enough. This was a great discussion with Mike Bloomberg and Lloyd Blankfein at the small business conference. GTAT/Wombat – Up and down on rumors whether or not Sapphire will be used in new IPhones. Poverty issues/Snow – Good points. Don't forget JPM is the biggest issuer of food stamp debit cards, taking in $6Bn in revenues on the backs of the poor. No wonder they keep trying to make more poor people! Big Chart – Good day for the RUT yesterday – good news out of Europe could push them up but BOE just held rates steads – won't be good of ECB does too. Dow popped to 16,750 (/YM) for another good short entry with tight stops over. 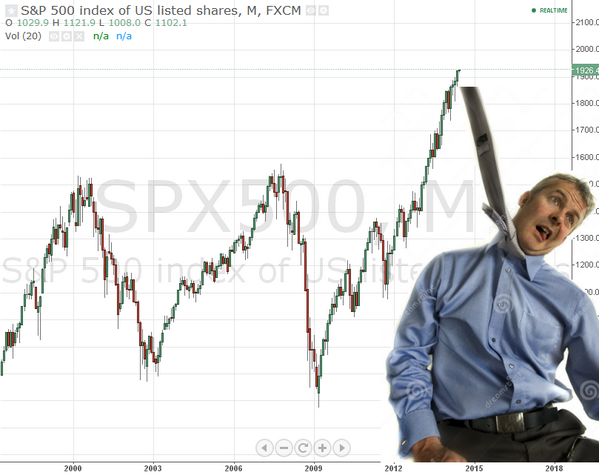 New highs/StJ – Thanks, I'll use that today. 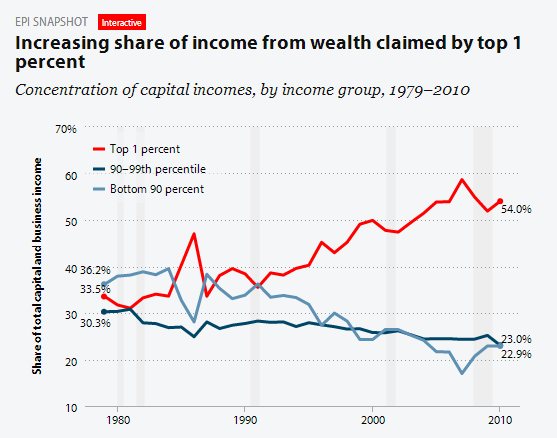 Top 10%/StJ – It's interesting how few charts break down the top 10%. 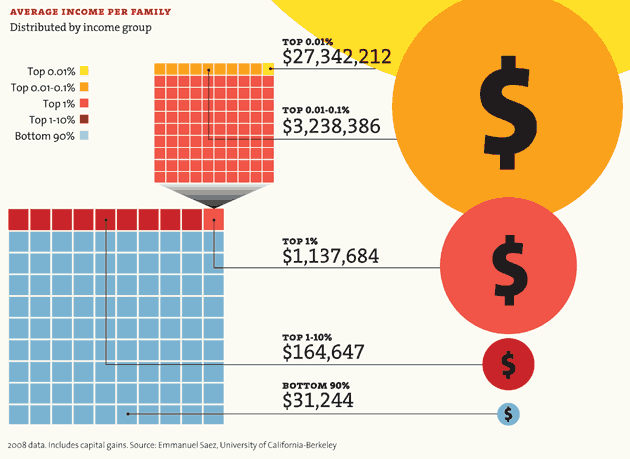 "THEY" are working very hard to convince those 28M people that they are aligned with the 3M in the top 1% (who themselves are fooled into thinking their interests are aligned with the top 30,000). Historical P/E/StJ – Since we had horrific crashes after 1929 and 1999, shouldn't we be throwing out those spikes rather than using them to calculate baselines? This is my problem with these kinds of studies – they take completely absurd input data and codify it as if it's as valid as the rest. Very simply (and maybe I'll talk about this in the post, since people don't seem to understand it) a stock with a p/e of 20 is paying you 5% back on your money. They earn $1 for each $20 you give them. Of course, to some extent, you can modify that 5% based on the presumed forward growth in profits but you also have to account for risk. We just saw a crash in which losses, especially in the Financial, Housing, Energy and Materials sectors, wiped out YEARS worth of gains. The possibility that it can happen again needs to be factored in. ECB just came in at -0.10% on deposits (0.15 on deposits)! How screwed up is the global economy that we have to do this? Still, it's less than was expected and, so far, the markets are liking it, but could be a head-fake in the Futures. Dollar climbing (80.80) as Euro falls ($1.356). Rally/Brit – They can go on a lot longer than you'd think. I saw the same signs in early 2007 but nothing significant happened until the summer of 2008. Same in 1998, where the markets went up another 40% in 1999 – that's why we're not shorting much – just in cash – these things are just too hard to time properly but, once they get going – there are plenty of opportunities to play! RUT 1,135 – NOW I'd like to cash those TNA calls!